Those who are not very familiar with the phenomenon of antibiotic resistance often use it as evidence to support evolution. However, those who understand genetics and biochemistry do not. That’s because most antibiotic resistance arises from genes that have been around for a long, long time. For example, an interesting study published just this year showed that many of the genes involved in antibiotic resistance were around with the mammoths, long before antibiotics were available. This seems to indicate that rather than being a response to the human production of antibiotics, at least some antibiotic-resistance genes are necessary for the proper survival of bacterial populations. A new study provides additional evidence for this idea. 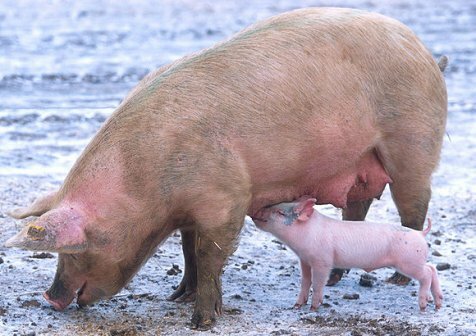 In the study, researchers analyzed pigs that were kept on a pig farm known to be antibiotic free for two and a half years. The results were not at all what they expected. You see, bacteria have two ways of storing DNA. They have their primary genome, which contains all sorts of genetic information. However, they also have small, circular strands of DNA called plasmids. An important difference between a bacterium’s primary DNA and its plasmids is that a bacterium can transfer plasmids to other bacteria. It cannot do so with its primary genome. Because of this distinction, plasmids are generally thought to be “accessory” DNA. They contain lots of nice information, but since they are not a part of the bacterium’s primary genome, they are considered non-essential components. Since copying a plasmid each time the bacterium reproduces takes energy, it is assumed that bacteria get rid of plasmids that they aren’t using. Well, it turns out that most known genes that confer antibiotic resistance to bacteria are found on plasmids. Since biologists assume that plasmids which aren’t used are lost after a few generations, it was assumed that if you get rid of antibiotics, a bacterial population would get rid of the plasmids that contained genes for antibiotic resistance in just a few generations. It turns out that they were wrong. So how do we explain this fact? As I said, plasmids take energy to copy in order to reproduce. In the lab, we know that bacterial populations often lose plasmids they have not used for a few generations.2 Without antibiotic exposure, the bacteria on this pig farm should have lost the plasmids that contained antibiotic-resistance genes long, long ago. Nevertheless, the vast majority of the bacteria still had those genes. The authors suggest that there are other (unknown) genes on the plasmid that are necessary for the continued existence of the bacteria. Thus, the plasmid is copied because it is being used for some other (unknown) purpose. This, of course, is a reasonable conclusion, and it supports the idea that at least some antibiotic-resistance genes are necessary for the proper survival of bacterial populations. Rather than being an evolutionary response to the development of antibiotics, then, the genes that confer antibiotic resistance to bacteria are an integral part of the design of bacterial populations, and antibiotics simply select for those individuals that possess them. Now please note that while most antibiotic resistance is conferred to bacteria because of specific genes, it does sometimes occur as a result of mutation. For example, a bacterium can become resistant to streptomycin if a mutation causes a defect in the bacterium’s protein-making factory, which is called the ribosome. That defect keeps streptomycin from binding to the ribosome, which makes streptomycin ineffective against the bacterium. However, such a mutation results in a loss of genetic information, because the defect causes the ribosome to be much less efficient at its job.3 So while the mutation does provide resistance to streptomycin, it does so by simply degrading something that already exists, rather than building up something new in the bacterium. So now you see why people who are knowledgeable about genetics and biochemistry do not use antibiotic resistance as evidence for evolution. Genes that confer antibiotic resistance were around long, long, long before antibiotics were developed, and they seem to be connected to the long-term survivability of a bacterial population. When mutations cause antibiotic resistance, they do so by degrading existing structures, not by building new structures. Either way, antibiotic resistance does not provide any support for evolution, at least not in the “flagellate-to-philosopher” sense. 1. Sepideh Pakpour, Suha Jabaji, and Martin R. Chénier, “Frequency of Antibiotic Resistance in a Swine Facility 2.5 Years After a Ban on Antibiotics,” Microbial Ecology DOI: 10.1007/s00248-011-9954-0, 2011. 3. Gartner, T. and Orias, E., “Effects of mutations to streptomycin resistance on the rate of translation of mutant genetic information,” Journal of Bacteriology 91:1021–1028, 1966. Given my background, this was of great interest. Basically, the data shows that bacterial resistance to antibiotics results from transfer or activation of existing genetic information (adaptation through natural selection) rather than the evolution of new information. Very excellent and relevant post. I vaguely recall reading about a study done using bacteria from the intestines of frozen arctic explorers, but I hadn’t heard about the mammoth study. Interesting!